DMT’s kit of honing cones and credit card style sharpener is perfect to keep your curved and small edges sharp. The tapered diamond slip stones are excellent for working gouges, wood turning, tool & die work, dental tools and more! The credit card style sharpener is great for small pointed tools and straight edges. This kit comes in a handy, durable folding storage pouch that holds 3 diamond cones and 1 credit card style diamond stone. 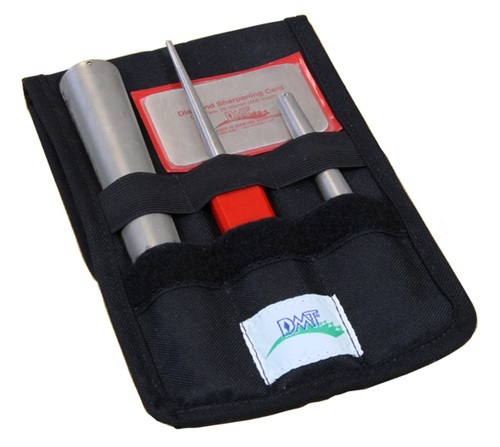 The carry case can be hung by a work area for easy sharpening tool access or store in a draw or on a bench. All sizes in Fine diamond (25 micron / 600 mesh) for a razor sharp edge. Credit Card Size: 3.25" x 2" x .05"
Large 3/4" to 1 1/4" diameter x 8" half-round cone.